A four-part series on book publishing! Today, we’re breaking down Part 3 of our series: hybrid publishing. Did you miss the other parts? Here’s our overview on what it takes to get published today. And, why social publishing matters. This week, we explore the mysterious world of hybrid publishing. Similar to my first post, I can’t help but think of Harry Potter when I think of this type of publishing. Specifically, I think of everyone’s favorite half-eagle, half-horse magical creature — the hippogriff. Like a hippogriff, hybrid publishing combines two starkly different things — traditional and self-publishing — into something entirely new. Hybrid publishing occupies a kind of middle ground between traditional and self-publishing. “In its simplest definition, hybrid publishing is traditional publishing in which authors invest in their own book projects in exchange for higher royalties,” writes Brooke Warner, publisher with hybrid publishing companies She Writes Press and SparkPress. In working with reputable hybrid publishers, authors have access to a team of professionals to help them edit, design, and publish a book that meets industry standards. The idea is simple enough, but in practice it can be hard to understand the difference between a hybrid publisher and other publishing service providers. 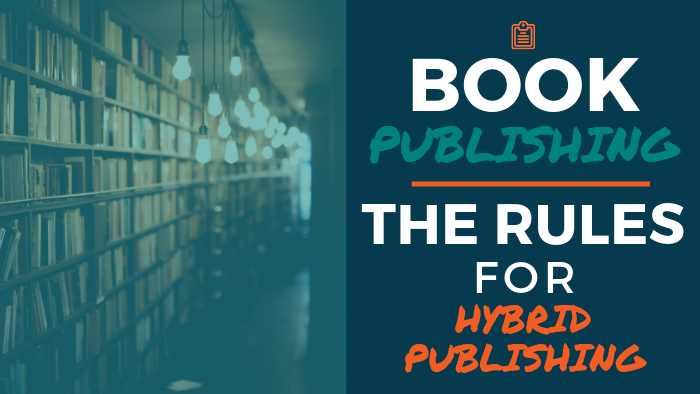 Last year, The Independent Book Publishers Association defined what it means to be a hybrid publisher, specifically outlining nine criteria hybrid publishers must meet. These criteria help protect authors as well as dispel some of the stigma behind paying to publish. More control. Because authors retain creative ownership when they choose to go with a hybrid publisher, they have more control over the process than they would with traditional publishing. Professionalism, access, and legitimacy. Hybrid publishing offers authors access to professional publishing services, and a team that will help the author navigate the publishing process. Higher royalty rates. This is really more of a double-edged sword. In hybrid publishing, the author puts a lot of money — and potential financial risk — in to publishing their book. But, if the book sells well, authors benefit from higher royalty rates. “I see hybrid publishing as an alternative to traditional publishing for those authors who either are getting shut out of the traditional publishing space … or for those authors who are disillusioned by traditional publishers,” Warner said, in an interview with The Self Publishing Advice Center. And though there are “bad actors” out there trying to take advantage of authors, there are companies out there like She Writes Press that are providing a valuable service. The grass isn’t always greener, and there definitely are some important things to consider before pursuing hybrid publishing. It comes with financial risk. As the author, you’re investing a substantial amount of money in to publishing your work. This opens you up to a real possibility of financial risk if the book doesn’t sell. This isn’t right for everyone. While it can be a great alternative for some, hybrid publishing is not for every author or every book. Authors must be willing put in the time and money to learn the business of publishing. There are exploitative companies out there. Aspiring authors must do plenty of research when considering hybrid publishing. There are companies looking to profit from an author’s dream to publish. Overall, hybrid publishing is complicated. It occupies a grey area within the world of publishing. But there’s no denying that, for some, it’s a viable alternative to traditional or self-publishing.